The letters “CE” appear on many products traded on the extended Single Market in the European Economic Area (EEA). They signify that products sold in the EEA have been assessed to meet high safety, health, and environmental protection requirements. When you buy a new phone, a teddy bear, or a electric bicycle EEA, you can find the CE mark on them. CE marking also supports fair competition by holding all companies accountable to the same rules. 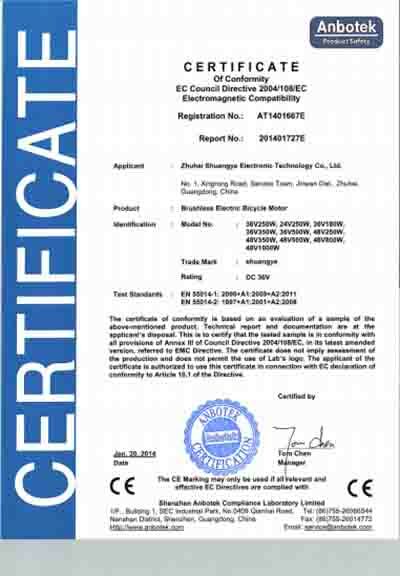 Our shuangye motor e-bike has already passed the CE certification, so you can rest assured to buy. shuangye electric bike with shuangye motor has high performance and high quality. Advantages:first the external characteristics of the motor is very good, and consistent with the load characteristics of electric bikes.At the same time, it can provide a large starting torque to meet the acceleration requirements of the electric bike.Second, the speed range is wide, and the motor can run in the low and high speed range. Third efficiency of the motor is high. Especially in the light load condition, the motor can still maintain a high efficiency, which is very important for the precious battery energy. Then, overload capacity is strong, which can meet the needs of the vehicle plug. Fifth,the regenerative braking effect is good, so the motor can fully enter the state of the generator when the vehicle is downhill or braking, thereby reducing the burden of the mechanical brake. The motor has the advantages of small size, light weight, high specific power, can effectively reduce the weight and save space. The motor without mechanical commutator, adopts the fully closed structure, to prevent dust from entering the motor, high reliability. The motor control system is simpler than asynchronous motor. Electric bicycle hub motors vs Mid-drive motors: Which is suitable for you?